Our recent progress in the production, bioconjugation and ultrahigh-sensitivity optical imaging of luminescent nanoparticulate biocomplexes has made us believe that the optical imaging of a single biomolecule tagged with a luminescent nanoparticle (NP) in a living organism is feasible! We have recently demonstrated that a single luminescent nanoparticle (called upconversion nanoparticle, UCNP) designed using the upconversion process  can be imaged using our home-built epi-luminescence optical microscope (see Figure), and also, through a quarter-millimetre haemolised blood layer! Figure. Single-UCNP correlative imaging using (A) TEM and (B) epi-luminescence microscopy images corresponding to the same areas of the sample TEM grid. 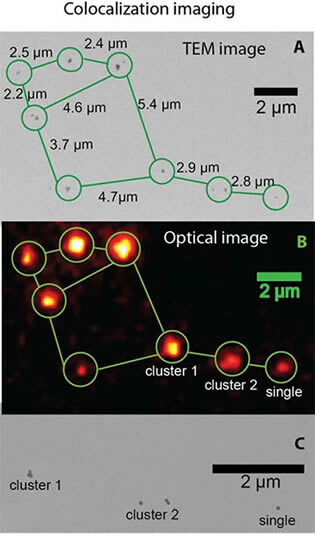 The distances between the individual (encircled) nanoparticles/clusters, given in (a), were precisely matched to these in (B) to identify the same UCNP constellation. (C) Close-up TEM image of the same area as in (A), where UCNP sites designated 'cluster 1', 'cluster 2', and 'single' correspond to the three sites in (B). The individual UCNPs within 'cluster 1' and ‘cluster 2' were optically unresolvable. “Single” designates a single UCNP particle clearly observable, as a diffraction-limited spot in (B). A theoretical analysis predicts the feasibility of the noninvaisive optical imaigng of a single UCNP through a 400-micron thick live biological tissue. This opens horizons of imaging rare biological events, as during cancer metastasis accompanied by infrequent shedding of single cells in the blood stream. Single nanoparticle diffusion in skin, epithelial tissue layer, and other superficial layes, represents another exciting application scope, where individual NP trajectoris in these tissue will report on the local diffusion properties. 1. Wu SW, Han G, Milliron DJ, Aloni S, Altoe V, Talapin DV, Cohen BE, Schuck PJ: Non-blinking and photostable upconverted luminescence from single lanthanide-doped nanocrystals. Proceedings of the National Academy of Sciences of the United States of America 2009, 106:10917-10921.